Trailer for "Five Nights at Freddy's"
This trailer made by Golden Lane Studio in Kiev with version 4 iPi MoCap software for a series of short films called “Five Nights at Freddy’s” has been watched by over 25 million people. 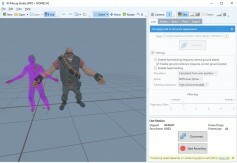 The achievement of real time preview capability from a single sensor in a markerless motion capture system is a significant achievement because it allows you to see the result of your motion tracking transferred to animated 3D characters in real time during the rehearsal of an actual performance. The new Live Preview panel showing "connect/disconnect" buttons and "record" (click to enlarge). You can even analyze the tracking of individual body parts. Take the example of a knight fighting a dragon. Of course you want to make sure the knight’s foot doesn’t accidentally step through the dragon’s leg. But the preview function of 4 of iPi Motion Capture software gives you enough accurate detail to make sure the knight’s forearm stays far enough away from his body to realistically accommodate the separation needed for his armor. Since you can visualize this as a preview, it allows users to see how the motion will look on a 3D character and make improvements without the need to redo multiple iterations of acting, recording and offline tracking. Version 4 also adds support for many new cameras such as the Intel RealSense D415 / D435 depth cameras, Asus Xtion2 motion sensors and Orbbec Astra / Astra Pro 3D as well as action cameras such as the GoPro and SJCAM. 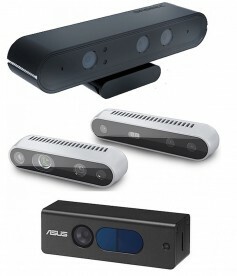 Newly supported cameras: top to bottom: Orbbec Astra, Intel RealSense, Asus Xtion2. The new real time tracking feature in version 4 uses iPi Recorder, a free software provided by iPi Soft for capturing, playback and processing video recordings to communicate to iPi Mocap Studio software, instantly transferring motion to 3D characters. Although version 4 of iPi Motion Capture software does not yet have multicam capability, you can load unsynchronized videos from multiple cameras in to the software and use iPi Recorder to sync and convert footage to .iPiVideo format used by iPi Mocap Studio. The “.iPiVideo format”, BTW, is just a sequence of individual I-frame JPEGs which Nikonov told me is optimized to conveniently let you go frame-by-frame when processing your motion capture. With version 4, iPi Soft is introducing a perpetual license model in addition to selling it on a subscription basis.